'Moist,' 'Dude' and 'Slacks': The Worst Words Ever? The New Yorker started a tongue-in-cheek contest last week to purge the worst word from the English language. Some of the submissions were words that are "like" overused. Others had "bad textures." 'Moist,' 'Dude' and 'Slacks': The Worst Words Ever? Is "slacks" the worst word in the English language? The New Yorker thinks so. Hollywood producer Robert Evans might disagree. 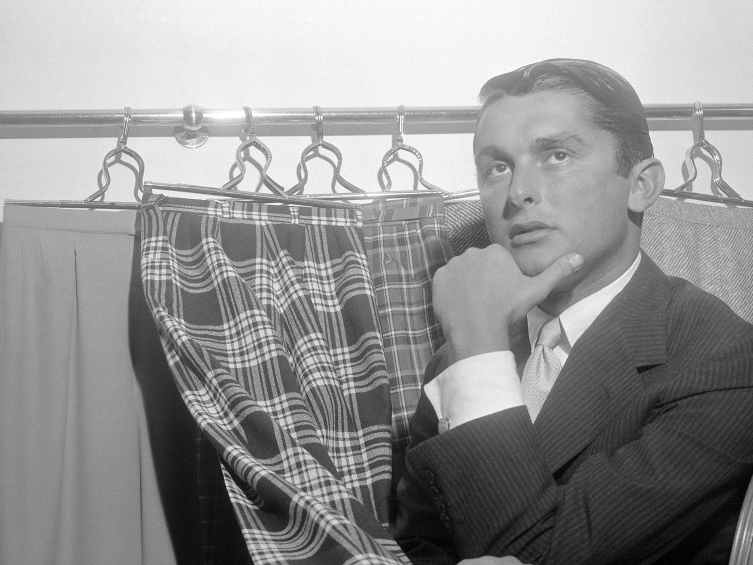 He poses here with some of his most fashionable slacks in 1957. If you could eliminate a single word from the English language — just zap it, nuke it, prevent it from ever being used again — what would it be? That's the question Ben Greenman of The New Yorker put to its readers last week. Greenman tells Melissa Block, host of All Things Considered, that the response was awesome. "Awesome," by the way, was chosen by many readers for elimination. "People hated it," Greenman says. The contest started, he jokes, when the magazine's staff "counted all the words in the language and we found that there was one too many." To collect the worst of the worst, they reached out for nominations via Twitter. Many of the words readers submitted are popular ones, including quite a few mainstays in the teenage vernacular. "We did detect some reverse-ageism," he says. "People didn't like 'like' used as a sort of stopgap. People didn't like 'dude.' "
Other popular submissions were so-called ugly words, such as "phlegm" and "moist." "People hate the word 'moist,' " he says. "Without the word, it would leave bakers, meteorologists and amateur pornographers lacking for what to do. I think it's the texture of the word." When it came to making the final selection, Greenman says the public was out. "It wasn't ever intended to be a popular vote. We were taking nominations after which we would go into the smoky backroom and pick a winner." So what does The New Yorker consider to be the worst word in the English language? "The more that word stayed on the table, the more preposterous it seemed because there are lots of other words for it," he says. "It sort of, in our mind, stuck in time. Maybe '78, '79." Like "moist," Greeman says "slacks" has a bad texture. "People said it felt like rubbing the palm of their hand over polyester, to say that word out loud," he says. So what happens now? Nothing, really. Greenman says someone from the magazine's copy department will write "slacks" down on a piece of paper, crumple it up and throw it away as a "sort of ceremonial sacrifice." Next week, he says, they might eliminate a number.